Looking for new light bulbs that are just as beautiful as they are energy efficient? Our decorative LED lights section is the perfect place to start. This month, we’re shining our product spotlight on one of our many fantastic LED globe light bulbs in the decorative lights section, the Halco ProLED Globe Lamp. The Halco ProLED Globe Lamp is a great option for almost any decorative application. Its 8 watts offer a lot of power, equivalent to a 40-watt incandescent lamp, allowing you to light a room while saving on energy costs. With instant-on capabilities, this lamp has none of the drawbacks you might expect with other types of energy-efficient light bulbs. This globe light bulb has a very long life: It’s rated to still put out 70 percent as much light at 25,000 hours of operation as it does when brand new. When it does finally run out of life, you can feel confident that it won’t damage the environment because it contains no mercury or lead. 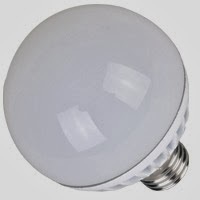 The bulb can be used in damp locations and open devices, and is suitable for use with dimmers. However, it’s important to note that it isn’t recommended for outdoor use or inside an enclosed fixture, as both of these applications can dramatically reduce the life of the lamp. You can find this bulb in our store for only $23.95 — a great price for such a long-lasting light bulb! Have questions about using LED lighting in your home? Leave us a comment and we’ll be happy to answer!